aka "I used to have a blog, let's see if it's still there"
So, about this book, which wasn't even one of the three I read on that rainy day, but squeezed itself in anyways. The first thing I want to say is, if Austin Clarke had his own food show, I would probably get cable just to watch it. I've heard him speak a couple of times, the first being at the Eden Mills Writer's Festival when I was still an impressionable high school student. I bought his book The Question that afternoon, but I still haven't read it, embarrassingly; I just liked having it. I recently heard him on the radio, reading from his novel More, and was reminded again of how much I enjoyed hearing him read his own work. I also recognized what has been holding me back from reading The Question: I am somewhat intimidated by his writing, by his stature as a writer, by the language he uses, and by the subjects he tackles. But then I was poking around in the food section of the library stacks at my local library and I swear that Love and Sweet Food literally leaped out at me. 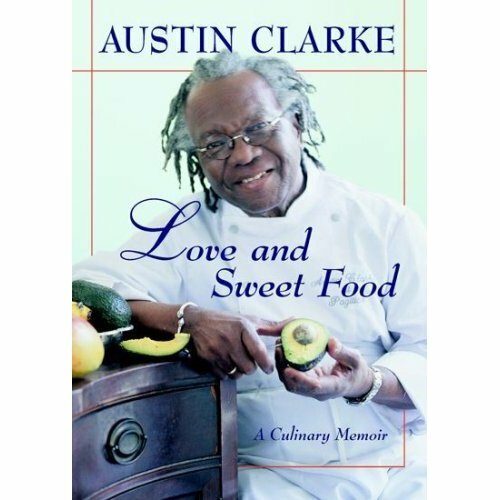 I love food, and I enjoy memoirs, so I thought, okay, here's an accessible way for me to get into reading Austin Clarke. I should mention, before I go much further, that this is a re-release of the book Pigtails 'n Breadfruit, originally published in 1999. It apparently didn't get very much attention, and that's unfortunate -- I hope that Love and Sweet Food, released in 2004, has been doing better, because it's a book that deserves to be read. My mother never had any great respect for my smallness or youth as a determiner of the amount or bigness of the tasks she gave me to do. At this time we lived in a village named St. Matthias. We called it Sin-Matthias. It was bounded on one side by the Marine Hotel, where "tourisses," mainly from England, danced in an open-air ballroom on Old Year's Night to a big band orchestra of Barbadian "musicianeers," and at the last stroke of midnight looking up at their merriment and foreigness we did not envy them their privilege. We merely pitied their dancing. The dialect grows stronger in the following chapters. It's a nice touch, leading to a feeling of complete immersion. Most o' the other islands have hinterlands and jungles and bush. And in these islands they used to have a lot o' slave rebellions. Barbadians didn't have tummuch o' these uprisings, because we didn't -- and don't -- have no place for rebels to hide, save in the sea, and the sea is not a hinterland. The only thing in the way of black uprisings and nationalist rebellions that happen in Barbados was one riot, called The Riot. That was in 1938, not even during slavery. And it wasn't nothing to brag about nor write in history books. Five people get kill. Five! But hundreds get lock-up. Three get drowned in the sea, when it was rough. One or two fellers get deported to Jamaica, where they founded a whole new tribe o' rioters, called the Maroons! So, as Barbadians, we're always a lil embarrass through lack o' forests and jungles and rebellions. Other Wessindians, like the Jamaicans and Guyanese, does sneer at we and say, "All-you don't have no hinterlands. All-you don't have no history. Nor no slave revolts. What the arse all-you have?" It worked for me here. So the writing was awesome, and ensnared me completely. The subjects Clarke tackles around the food and the recipes include his childhood growing up in Barbados, politics, slavery, and the remarkable women of Barbados. I don't know that I would call it a memoir, exactly, despite what the cover says; it's more a series of vignettes, some to do with Clarke and some not, surrounding food. In fact, if it's anything coherent other than a food book, it's an affectionate tribute to his mother, who sounds like she was an absolutely formidable woman. Clarke also shows, clearly and definitively, that the way to understand a culture's heart is through its collective stomach, and the food traditions in a culture can have a lot to say about the people who eat it. Each chapter starts with a story, an anecdote that is connected in some way to the dish Clarke will then introduce in the second half of the chapter, and tell us how to cook as though he were right there in the kitchen with us. Sometimes the anecdote works its way back into the recipe, other times not. It's a fabulous way to be introduced to a culture I know very little about. It's also because of Clarke's enthusiasm and excellent writing that I am now actually quite curious to try cooking with ox or pig's tails. Many of the recipes call for various ingredients ("ingreasements") that I would have a heck of a time trying to find here, and previous to reading this book I would definitely have been okay with that. But I want to try Smoked Ham Hocks with Lima Beans, Pig Tails and Rice. Or his version of Split Pea Soup. Or, especially, the Barbadian-style pork chops. I'll have to make do with what ingreasements I can get here, but I'm going to try anyways. Highly recommended if you're interested in West Indian culture and/or food in general, or if you don't know anything about either but are curious. I suggest reading it with a rum and cola (Barbadian rum, of course) and sitting out in the hot sun, to add authenticity to the reading experience. I'm a librarian who loves gardening and old video games and doesn't do as much of either as she used to. Most of my time is taken up with parenting or library-ing, but sometimes I still read and think about writing about the things I read. And once in a very long while I actually do. It’s our January Boxing Sale! These posts are licensed under a Creative Commons Attribution-Noncommercial-Share Alike 3.0 Unported License.